I posted a picture of Zoey when we first got her, now she's just over a year old. She loves the snow and loves chasing discs. So put them both together, along with some frozen fingers, and you get a pic like this. 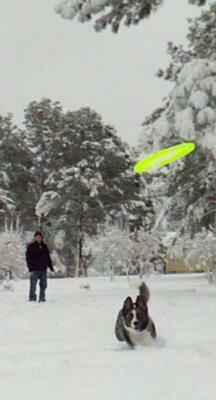 Here she is chasing one down thrown by our son as I sit in the neighbors yard to get the picture. This is from about 60 feet or so out. Told our son to aim at me and he pretty much put it right over my head, which brought Zoey right to me running full-on. Glad I could help out some. She will now reverse her direction and do a U-turn around me when I tell her "round-round", that took about 4-5 runs for her to start understanding, they are so smart. I just posted another video. We started with her pretty much the day we brought her home, she was about 2 months old. We play alot of disc golf and we use what's called mini's to mark our discs location before taking the next shot. They're just very small discs, about the size of a small pancake and very light-weight. We started throwing these in our house while playing with her inside and outside would throw a regular disc but throw only rollers so she wouldn't hurt her mouth trying to catch it. Just be sure to get the correct discs from the start, you don't want them to get hurt by throwing a disc that it too heavy or the edging is too sharp. There are a few major mfg that make them specifically for disc dogs. The ones we use are called Hero (www.herodiscusa.com). We like them but honestly have never used any of the others. These throw really well, even for some good distance. Check out Zoey on youtube "Zoey Catching Discs". I'm throwing them across both ours and our neighbors yards. We use this little game to try and wear her out, try. She really loves chasing them on the beach, that's her favorite. That is aweseom. I am getting a new pup Dec 6 and I am hoping to be very active and hope to be able to throw the frisbee with her .. I am also worried about her being off the leash tho too. Never had a dog that I could do that with.